Published: Sept. 26, 2014 at 07:56 p.m. Predictions are a big part of this column, so can I just go ahead and predict Giants TE Larry Donnell is going to see a huge ratings increase in next week's installment? I mean, I know this kind of puts me up there with some of the great prognosticators in the history of the world, but no prediction here is going to be too bold! Actually, it's kind of a bummer for fans of the Giants who use their favorite squad while they play Madden, because you're going to need to wait an extra week for Donnell's monstrous increase. Or what I can only assume will be a huge ratings bump. He is up to an 81 right now, thanks to a great game in Week 3. His Week 4 totals should be even better. Eli Manning is going to need to see his rating increase, too. He looked pretty bad during the preseason and even early in the first two weeks of the season. Us fantasy heads were even starting to look at the Giants as one of those teams you start a DST against. But the Giants looked pretty good. Well, except for Rashad Jennings. But I'm not sure he's going to be hit too hard in the ratings, is he? So what do you say, do you want to move on to this week's movers and shakers? "The rookie's best performances have come under the lights, intercepting two passes in the Bears (win) in San Francisco last week and following it up with another pick in Monday night's win against the Jets. 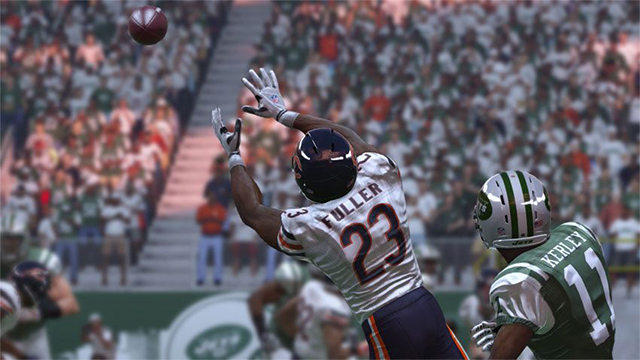 "In the latest 'Madden NFL 15' roster update, Fuller receives a four-point increase all the way to 82 OVR. His boosts include SPD (+1), STR (+3), AGI (+2), AWR (+6), CTH (+4), TAK (+3), STA (+2), BKS (+3), PRC (+4), MCV (+2), ZCV (+1) and PRS (+3)." I knew you would see it my way! Also receiving increases for the week: Kirk Cousins (+3) to 81 OVR. I know a lot of you are going to jump off the Cousins bandwagon right now. Oh, would you stop! Cousins is an inexperienced quarterback with a first-year head coach who couldn't handle the three-day week. This is to be expected as long as these Thursday night games continue to be a thing. If Cousins struggles after 10 days of film study and preparation, then you have every reason to be concerned. But for now, let's all chill out. Jeremy Maclin is now an 85 OVR (+2) after a huge week against those Washington D.C. football players. 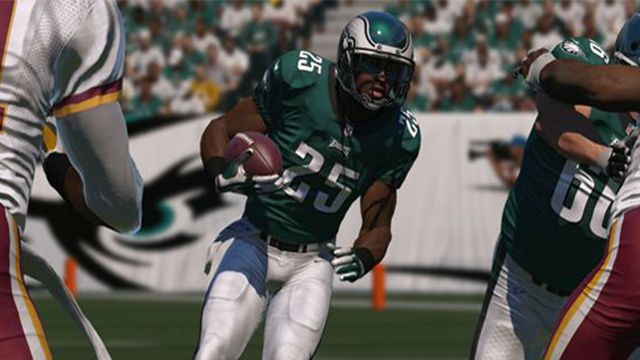 Jordan Matthews is also up to a 74 OVR (+1), which makes this seem like kind of a tough room. These guys were amazing. At least kicker Cody Parkey went up four points to a 69 OVR after another fine outing. How long must we go before Eddie Lacy starts drawing comparisons to Trent Richardson? Both were highly touted Alabama running backs; both great during their rookie seasons, and then kind of sunk during their second seasons. And, if you want to throw another snake-bit Alabama running back into the mix, what about Mark Ingram? But how long will Lacy toil before we finally make those comparisons? Do the Colts need to trade for him? Will that cement it? No matter, he's down two points to 85 OVR. The Dolphins were slow to select a starting quarterback this week. Well, at least publicly. Ryan Tannehill was one of the big tumblers this week, down three points to an 82 OVR after being shamed internationally! That's right, the Dolphins will be in London this week to take on the Raiders, so this was international news! This is the one part of the column where I must absolutely throw the challenge flag at the ratings machine. And this has to do with LeSean McCoy, who lost points this week. Hey look, this was a tough matchup for McCoy, and sometimes things don't go your way. But is he really less of a football player this week? McCoy should have been given a mulligan before we go dropping him down. He lost two points and is currently a 95 OVR. So he's not terrible, but still. And Blake Bortles lost a point for being absolutely awesome against the Colts in mop-up duty! You have to be kidding me. I don't want to even talk about it. 6. Bortles is going to be one of the biggest movers in the game this week. He's going to have a pretty good game. There is a new world order down in Duval County, Florida. Do you want to get on early? Seriously, Cousins was old news. Bortles is for the Madden hipsters. 5. Cousins will not throw another interception this weekend. 4. The 49ers will knock off the Eagles this week. I know, it seems like it would be easy to predict the Eagles to continue their winning ways. And when you have the best second-half team against the worst second-half team, this seems like a lock. But in this NFL, good teams, desperate for a win, tend to prevail. The 49ers have one more knockout blow left in them, and they even up here. 3. Chris Johnson lost two points to fall to a 78 OVR. But he's going to end up beating the Lions this week because the matchup is terrible and everybody has written him off. Because football. 2. Matt Forte is going to have a breakout game against the Packers. He's been due for quite a while and he has a great history against the Packers. Forte will have more than 200 scrimmage yards and two touchdowns in this one. I just can't predict a win for the Bears. My heart wants to, but my head is screaming nooooooooooooooo! 1. Steve Smith Sr. is going to own the Panthers this week. Triple S has the pedigree in the NFL, and some consider him to be a cerebral assassin. He is going to be the hunter in this game, and he will find the Panthers and deliver a sledgehammer-like blow to his former team. At some point, Carolina and its fans will bow down to the king.